Facts and Figures About Kathmandu City. These Figures Are Based On Census Report 2011. In Nepal, there are five major climatic regions. Among these, Kathmandu Valley resides in the Warm Temperate Zone (elevation ranging from 1,200–2,300 metres (3,900–7,500 ft)), where the climate is fairly temperate, atypical for the region. This zone is followed by the Cool Temperate Zone with elevation varying between 2,100–3,300 metres (6,900–10,800 ft). 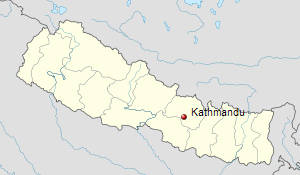 In the Kathmandu Valley, the average summer temperature varies from 28–30 °C (82–86 °F). The average winter temperature is 10.1 °C (50.2 °F). The city generally has a climate with warm days followed by cool nights and mornings. Unpredictable weather is expected given temperatures can drop to 3 °C (37 °F) during the winter. Rainfall is mostly monsoon-based (about 65% of the total concentrated during the monsoon months of June to August), and decreases substantially (100 to 200 cm (39 to 79 in)) from eastern Nepal to western Nepal. Rainfall has been recorded at about 1,400 millimetres (55.1 in) for the Kathmandu valley, and averages 1,407 millimetres (55.4 in) for the city of Kathmandu. On average humidity is 75%.